Hundreds of lithium polymer (LiPo) battery balance chargers in the market, but not much has changed for a while, the same user interface and the same programming codes reused. 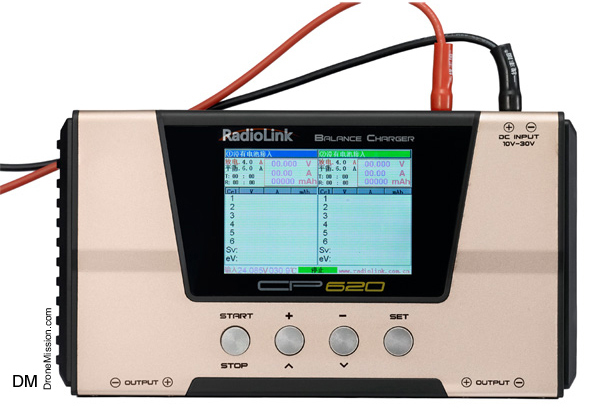 Radiolink, a leading radio manufacturer is among the few that has taken the lead to change the way we charge with the CP620 hybrid charger. This round reprogram to improve efficiency and lower consumption for today's electric RC. Be back with the details and photos shortly. We will update this post. Join us? Please share your videos too. In terms of ranking, I would say it is in the top 5 favorites during this season, recorded on August 2016. Subject to change weekly. Last edited by diydrone; Aug 17, 2016 at 02:01 AM. Just for info there is already a thread on this product started by the Banggood rep.
Leo, great i hear you were asked to review the CP620 by Tobey, look forward to the videos and detail shots. I was wondering if charging two LiPo at the same time will take longer, let me know how it goes. Hey yes. We did not asked for it, but it came to office for an independent review, test and video shoot. We did not get to try out the Eachine Gemini dual charger, so this is new, we will report on our findings. Cheers! This looks like an awesomely good charger. Look forward to the reviews and feedbacks. Sub! Who is John Powers ? Mine arrived today. Not had a good chance to run it through it's paces. I did test the input voltage and it alarms at 30.4V so unlike it's little brother the CB86-Plus this one can run on a +/- 5% 30V PSU. The CB86 is hard at 15.0V needing a less than 15V PSU to run. Not a fan of white font on green background. See screenshot.